Thank you so much for visiting my little space on the internet. You may be wondering - What sets my dresses apart from the rest? I only use the highest quality tulle, sourced from a single, dependable supplier, which has a consistently superior look and feel to the tulle readily available online or at your local craft store. This means my dresses are less fuss, do not tangle or require constant grooming like many other tutu dresses available from other sellers. My dresses are created in such a way that is completely unique to other no-sew options and will last far longer than a dress you can find anywhere else. I do not cut corners or pinch pennies when creating a gown; Every single dress that leaves my studio is made from materials that are the highest quality on the market. I only purchase supplies that are of the utmost quality to ensure your product exceeds your expectations and will take your breath away when your final product arrives. Each dress is made with roughly twice as much tulle as other leading dress makers to ensure complete coverage and a full, twirlable skirt! 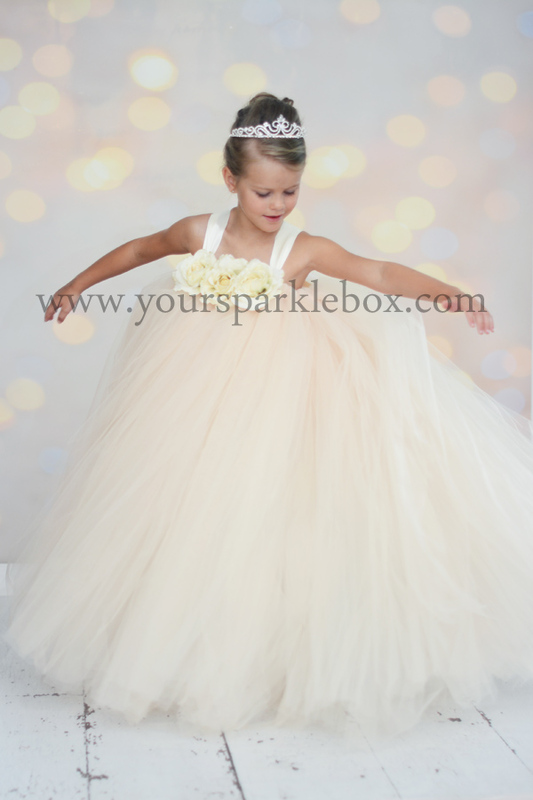 Whether you are looking for a dress for a wedding, a special birthday or another memorable event, you will make every little girl's dream come true with one of these gowns. Created just for her, she will look like the belle of the ball and feel like a true princess!